basically refer to finger food, the most famous being the olive-the quintessential Spanish and, in fact, Mediterranean finger food. If a utensil (like banderillas, decorated toothpicks that get their name because they look like the darts used in a bullfight) is required to eat the food, the tapa is called pinchos. Cazuelas (little dishes) are tapas that usually come in sauce, for example, albóndigas (meatballs) or shrimp fried in garlic. 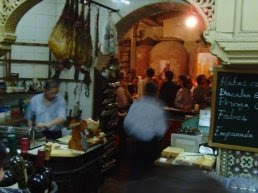 All regions of Spain have tapas, although Catalonians have not traditionally eaten tapas and do so now only because of the unification of modern Spain. The Catalans were gastronomically closer to the French and Italians than to the Spanish. The Basques call their tapas pintxos from the Spanish word pinchar, to prick because they were once always served with toothpicks to pick them up. The Spanish proverb comiendo, comiendo el apetito se va abriendo--appetite increases with constant eating, might give you a better idea of what lies behind the culinary experience of Spain. Wow! I am just discovering your blog and am learning new things already! Wonderful! And we fell in love with Tapas on a recent trip to Basque Country. Don't miss the web site www.cliffordawright.com as there is tons more there.